Are you claiming a business loss at tax time? 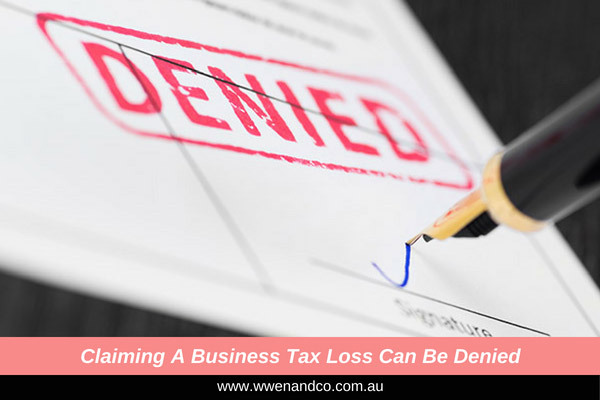 Business owners are naturally keen to be able to absorb a business loss as a tax deduction, but it also pays not to stray too far from the generally accepted rules regarding tax losses — there are circumstances where the ATO is legitimately able to deny such claims. Tax law has measures in place to ensure such deductions are limited to those businesses that are legitimately eligible — such as the continuity of ownership and the same business tests — but there is also the measure above, which the ATO calls an “integrity” safeguard, that may result in a denial of a claim for losses that business owners should keep in mind. There is some balance to the rules in that the Commissioner of Taxation is “prevented” from disallowing the deduction should “continuing shareholders” stand to benefit from the relevant income. However, there is still a fair amount of discretion left to the Commissioner in how the business loss rules are applied. Remember also, different business structures have different rules on loss claims. Individuals can generally carry forward a tax loss indefinitely but must claim a tax loss at the first opportunity. You cannot choose to hold on to losses to offset them against future income if they can be offset against the current year’s income. Companies can carry forward a tax loss indefinitely, and use it when they choose, provided they satisfy the above-mentioned continuity and same-business tests. That the business would have derived the income or realised the capital gain regardless of the tax loss being available. Have questions on your business loss and tax issues? Please contact the accountants at our Epping office.